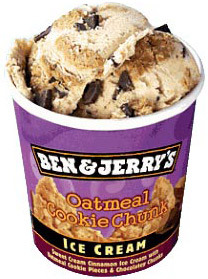 2005 Tagline: With the frenzy of fan mail we received when we introduced Oatmeal Cookie Chunk as a for-a-limited-time-only flavor in 2003, we couldn't possibly banish it to the flavor graveyard forever. 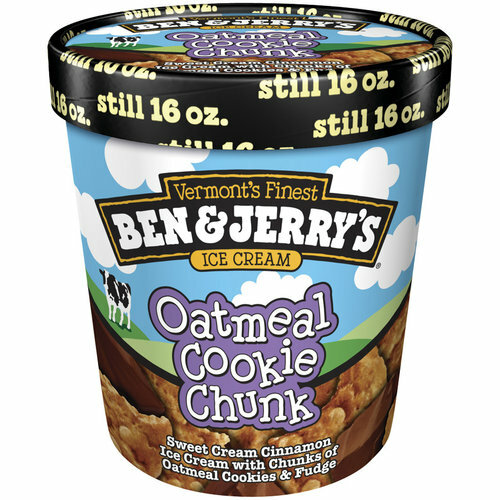 With pleas from folks like you, we had to bring it back as a full-time flavor! 2003/2004 Tagline: To us, there's nothing more familiar or comforting than just-out-of-the-oven cookies. 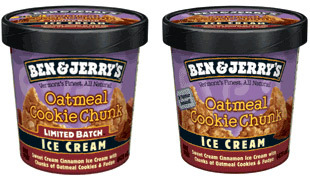 We created this flavor to celebrate the humble oatmeal cookie, & because we love chocolate, we threw in lots of fudge chunks in lieu of raisins. Ingredients: Cream, Skim Milk, Water, Liquid Sugar, Sugar, Unbleached Wheat Flour, Corn Syrup, Egg Yolks, Rolled Oats, Expeller Pressed Soybean Oil, Coconut Oil, Sweetened Condensed Skim Milk, Cocoa (Processed With Alkali), Cocoa, Apple Juice Concentrate, Soluble Raisin Solids, Cinnamon & Allspice, Guar Gum, Baking Soda, Salt, Natural Flavors, Soya Lecithin, Milkfat, Carrageenan, Vanilla Extract.